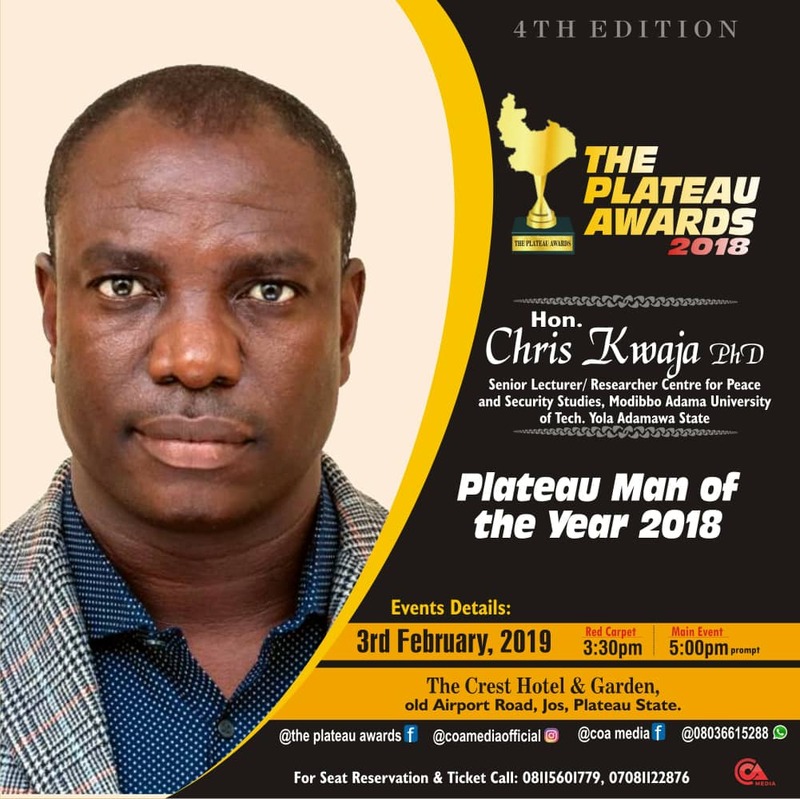 Plateau Awards: Meet Dr. Chris Kwaja, the "Plateau Man of the Year"
Modibbo Adama University of Tech. Member, United Nations Working Group on the Use of Mercenaries as a Means of Violating Human Rights and Impeding the Exercise of the Right of Peoples to Self Determination. Chris Kwaja is currently a Senior Lecturer and Researcher at the Centre for Peace and Security Studies (CPSS), Modibbo Adama University of Technology, Yola, Adamawa State, Nigeria. Prior to joining the CPSS, he lectured at the Centre for Conflict Management and peace Studies, University of Jos, Jos, Nigeria. He is a Visiting Research Fellow with the Centre for Democracy and Development (CDD), Abuja, Nigeria. He is also an International Fellow at the Watson Institute of International Affairs, Brown University, United States. He holds a Doctorate Degree in International Relations and Strategic Studies from the Department of Political Science, University of Jos, Jos, Nigeria. In 2008, He was an exchange fellow of Dispute Resolution at the University of Massachusetts, United States. He is also a recipient of several research awards such as the CODESRIA Governance Institute on Private Military and Security Companies, 2009; United Nations Mandated University for Peace Doctoral Research Award, 2009; as well as the Peace Fellow Award of the West Africa Research Centre, 2010. He is an alumni of the Geneva Centre for Security Policy, Switzerland, 2010. From June 2011 to May 2015, He served as Director General, Research and Planning, Governor’s Office, as well as Honourable Commissioner for Local Governments and Chieftancy Affairs, Plateau State, Nigeria. Between June and July 2016, He was a fellow of the Brown University International Advanced Research Institute (BIARI), Brown University’s Watson Institute for International Studies Rhode Island, United States, as well as the International Peace and Security Institute (IPSI) Peacebuilding Fellowship on Post-Conflict Transitions and international Justice, The Netherlands (Clingendael) Institute of International Affairs, The Hague, Netherlands, respectively. In 2016, he was appointed a Member of the United States Institute for Peace (USIP)- Senior Working Group (SWG) on the Drivers of Instability in Northern Nigeria, with specific reference to developing inclusive and sustainable strategies for addressing the drivers of instability in Northern Nigeria. He was also a Member of the Advisory Committee of the Search for Common Ground (SFCG), Protection of Holy and Sacred Sites Project in Northern Nigeria. In 2017, Kwaja also won the Search for Common Ground (SFCG) Africa Research Fellowship. In the same 2017, he was appointed a member of the Community of Practice (CoP) on Transitional Justice in Nigeria, with specific reference to the North East region of Nigeria. The CoP is a partnership of the Centre for Democracy and Development (CDD), Nigeria Bar Association (NBA), Federal Ministry of Justice, National Human Rights Commission (NHRC), as well as the Presidential Committee on the North East Initiative (PCNI). In January 2018, He was appointed Senior Advisor-Nigeria by the United States Institute for Peace (USIP) with mandate to provide strategic advise to grow USIP’s work in Nigeria and the broader Lake Chad Basin Area (covering Cameroon, Chad and Niger Republic), provide advise on building and strengthening partnerships with government, security officials, civil society networks, civic leaders and international non-governmental organisations among others. In view of his research and policy related work and expertise on African security, the United Nations Human Rights Council appointed him as African Representative on the United Nations Working Group on Mercenaries for a three year tenure (2018-2020). Dr. Kwaja has been instrumental to the emergence of several civic groups in Nigeria and beyond. The Not Too Young To Run bill that was signed into law by President Muhammadu Buhari was the brain-child of one of the organisations that he currently sits on its board - Youth Initiative for Advocacy, Growth and Advancement (YIAGA - Africa). In recognition of his ground breaking research and policy work on conflict, peace and security, Dr. Kwaja was commissioned by the Office of the Vice President of the Federal Republic of Nigeria to design the peacebuilding, governance and rule of law pillars of the National Livestock Transformation Plan (NLTP), which was unanimously adopted by the National Economic Council on Thursday, 17th January 2018. Prior to this, he was commissioned by the United Nations Development Programme (UNDP) to design an implementation strategy towards addressing the challenges posed by violent extremism in Northern Nigeria. His services has over the years been utilized as a consultant by several institutions such as the World Bank, United Nations Women Fund (UN-Women), European Union, British Council, German International Cooperation (GIZ), Open Society Initiative for West Africa (OSIWA), National Institute for Policy and Strategic Studies (NIPSS), Institute for Security Studies. Dr. Kwaja has currently has over 70 scholarly, technical and policy publications to his credit in journals, books, monographs series, technical reports, policy and security briefs among others. His research and policy work covers areas such as the politics of identity in Africa, the privatization of security, democratization and governance, conflict and peace studies, as well as security sector reform in transition societies. So far Dr. Kwaja has travelled to about 30 countries across the world, which include – Austria, Belgium, Benin Republic, Burkina Faso, Cameroon, Cote d’Ivoire, Ethiopia, France, Ghana, Germany, Greece, Israel, Italy, Kenya, Liberia, Malaysia, Netherlands, Pakistan, Rwanda, Senegal, Sierra Leone, Spain, South Africa, Switzerland, Togo, Turkey, United Arab Emirates, United Kingdom, United States of America.